We have taken our patented ketone technology and created the WORLD'S FIRST EXOGENOUS KETONE SPRAY! Learn more here! Kegenix IGNITE Ketone Spray is the first of its kind! We have taken our patented ketone technology and created the WORLD'S FIRST EXOGENOUS KETONE SPRAY. Kegenix IGNITE Ketone Spray was designed to utilize the power of ketones in a tangy citrus spray, to address the four different conditions our customers are always looking for help to solve. Ketones are a powerhouse of energy, having 225% more energy than glucose, while not producing the by-product of lactic acid. 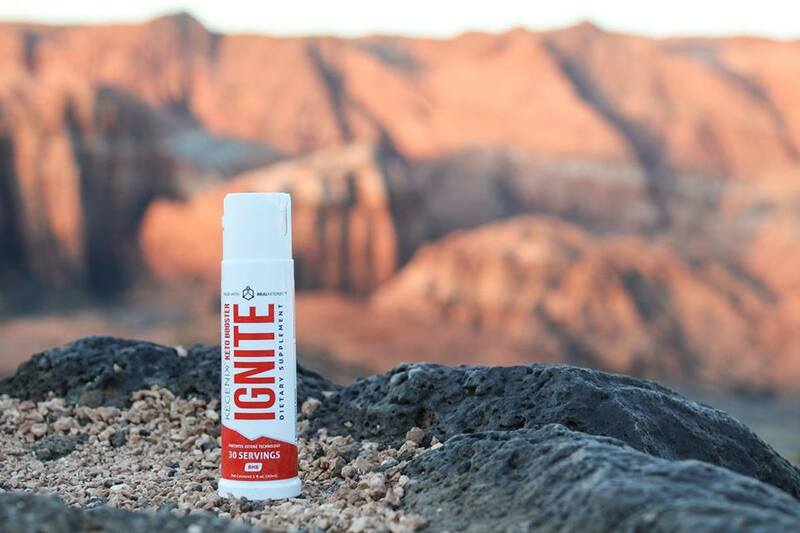 IGNITE combines ketones, caffeine, and AAKG (known for its ability to increase nitric oxide production) with glucuronolactone to help INCREASE STRENGTH AND LEAN MUSCLE GAINS while inhibiting the synthesis of toxic by-products and REDUCING FATIGUE. You now have the perfect PRE/POST WORKOUT keto diet supplement. Ketones are the number one treatment for epilepsy, and are now being investigated for their strong neurological energy properties in HELPING MOOD AND SLEEP DISORDERS, and REDUCING STRESS. When ketones are combined with N Acetyl L Tyrosine (NALT), a rapidly absorbed and highly bioavailable form of L Tyrosine can provide some amazing mood calming effects. This is because the combination of ketones and NALT influence adrenaline and dopamine in the brain in order to reduce stress and mental agitation. Ketones are well known for their ability to SUPPRESS APPETITE AND CARB CRAVINGS because they work to suppress ghrelin, the hunger hormone. As you go through the day, you may experience a time when you feel a little hungry. IGNITE is a keto diet supplement designed to deliver CRAVE-FREEING ENERGY to get you past those points of hunger or cravings. The term "brain fog" is often used to describe a lack-of-focus, poor memory, lapses in cognition, etc. What science has found is this "brain fog" can be caused by having very little GABA and way too much glutamate. This can happen when the brain is overrun by glucose or becomes insensitive to glucose utilization. As a result, the brain suddenly can't process all of the energy it needs, leaving you "foggy". Ketones and a ketogenic diet appear to replace the energy and reduce the damaging effect of excess glucose to the brain. This can increase the GABA and its ability to resume being the powerful neurotransmitter it is. This relieves the brain of its stress, and helps it become MORE ALERT. Now, add the natural metabolites of caffeine and glucuronolactone, along with IGNITE'S ketones, and you get that MENTAL LIFT AND PERFORMANCE that people report as "my brain fog was suddenly lifted." Click here to order while supplies last!